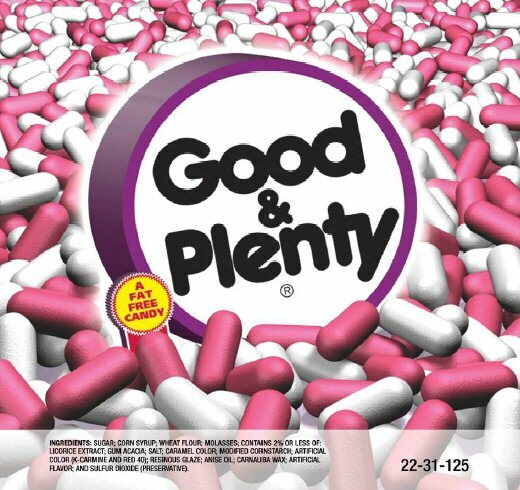 Good & Plenty Vending Candy is made by Hershey Candy and is the oldest branded candy in the United States. This nostalgic chewy licorice candy is well known for it's bright pink and white candy shell coatings. These colors really make them stand out in any vending machine that has a candy dispensing wheel. These come with a FREE eye catching 3D image display card for your bulk vending machine. Includes six 5 lb bags of candy. Need a machine to vend these chewy licorice candies? Be sure to see our full line of candy vending machines. Made by Hershey, this bulk vending candy is OU Kosher Certified. The candies typically vend for 25 cents in commercial vending machines that have an adjustable candy dispensing wheel which controls the number of pieces that vend per quarter. They will also dispense in our candy banks and dispensers. Candy is best stored in a cool, dry, low humidity location. Their shelf life can be up to 18 months if not exposed to extreme hot or cold temperatures.